Old Jake’s was brewed to pay homage to our beloved brewery dog, Jake, and his 16 years of official door greeter service. Mirroring Jake’s spunky but welcoming and warming personality, this dark saison provides a light spiciness provided by Hallertau hops to round out the use of malted wheat and roasted wheat provided by our friends at Red Shed Malting. 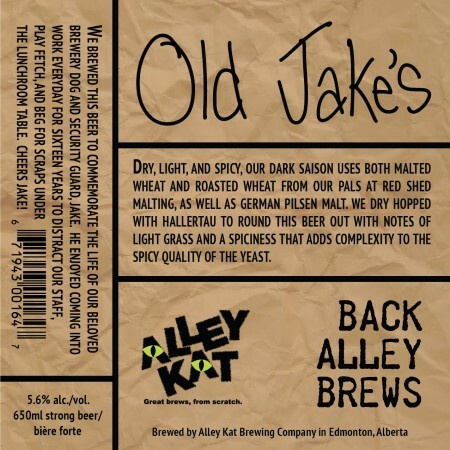 Old Jake’s will be released on Thursday November 15th, and will be available in 650 ml bottles at Alley Kat and select retail stores in Alberta while supplies last.